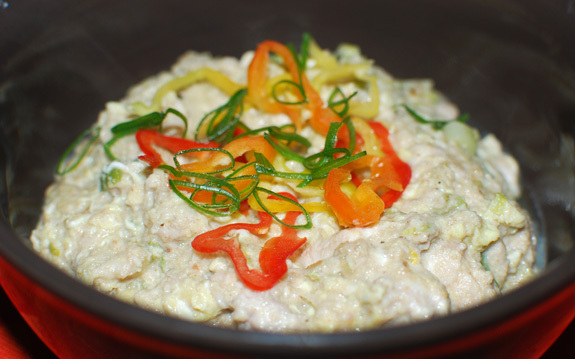 Unlike some of my previous dishes questionably named after Eastern European cities, this recipe truly was inspired by something I ate in Telavi, Georgia. Against all odds, the deserted restaurant in the town center featured brains on its menu, and they were delicious! The whole dish has a very mild flavor and melts in your mouth, and the way it’s prepared makes it easy for the squeamish to forget what they’re eating. This is a very quick recipe, the main challenge being to find brains. You can use lamb, pork or veal brains based on their availability, the only difference will be their size. It is not uncommon to have to buy a whole head, in which case I recommend you ask your butcher to cut it in half for you — cutting the head yourself at home, either with a hand saw or a hammer and chisel, is a pretty tedious task. As I learned the hard way. Place the brains into a brine made with 1.5% kosher salt, and refrigerate for at least 12 hours. Drain the brains and gently pat dry with paper towels. Coarsely chop into 1″ cubes, and season with salt and pepper. Melt 1/3 of the butter in a pan over medium-high heat until brown (not black!). Add the brain cubes and scallion whites, and cook until golden brown, stirring regularly. Add the wine, reduce by half, then add the stock and cook until completely reduced, still stirring occasionally. Mix in the egg and the rest of the butter, cook for a couple minutes, and remove from the heat. 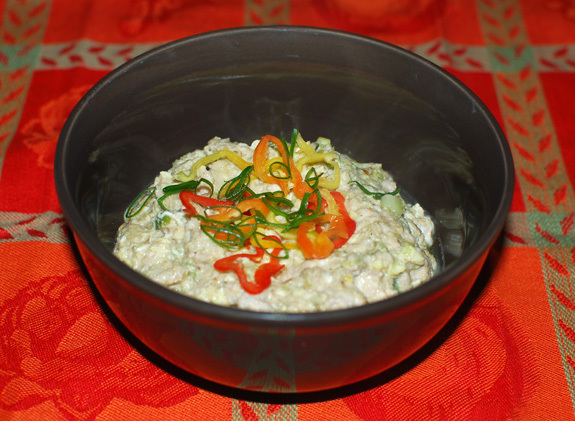 Transfer to a bowl, top with the scallion greens and chili pepper, and serve immediately. Poutine is a dish from Quebec consisting of French fries and cheese curds topped with gravy. Not very Eastern European, you may say. I could argue that there’s nothing more Russian than a recipe containing both potatoes and cheese, but that’s not the point. Poutine is also the French spelling of Vladimir Putin‘s last name, and I intend to use this uh-hum pun on words as the inspiration for my recipe. The former Russian President turned Prime Minister is known as Russia’s Man of Action. His more recent feats include crossing Siberia in a Lada, co-piloting a fire-fighting plane, riding a Harley-Davidson trike in Ukraine, singing patriotic songs with deported spies and even checking sausage prices in a supermarket. He’s every woman’s dream. Can such a man eat an ordinary plate of fries? Of course not! I needed an ingredient unusual and extreme enough for this fearless living legend: bear meat — medvezhatina in Russian. Bear, Russia’s national personification and symbol of Putin’s own political party, United Russia. Preparing a really tasty version of this simple dish is much harder than it seems, because each ingredient is better suited for factory production than in-house preparation. Good fries take time: peeling, cutting and blanching the potatoes can easily occupy one person full time in a restaurant. Of course you can buy frozen, peeled, cut and pre-blanched fries instead. Cheese curds are even more time-consuming. Home cheese-making remains a marginal hobby, and it’s extremely rare for a restaurant to make its own cheese — except maybe mozzarella, and even then the curds are sometimes bought elsewhere. To make things worse, in a good poutine, the cheese must make squeaky noises when you eat it, a property that requires homemade curds only a few hours old! Again, factory-made curds are an appealing solution. As for gravy, how the hell are you supposed to get all those meat juices for a dish that doesn’t even include meat in its original recipe?! Too often, if not always, the answer consists of a can or a powdered mix — check out the scary ingredients of this one — producing a sticky, gluey mess that almost makes you feel sorry poutine contains gravy in the first place. 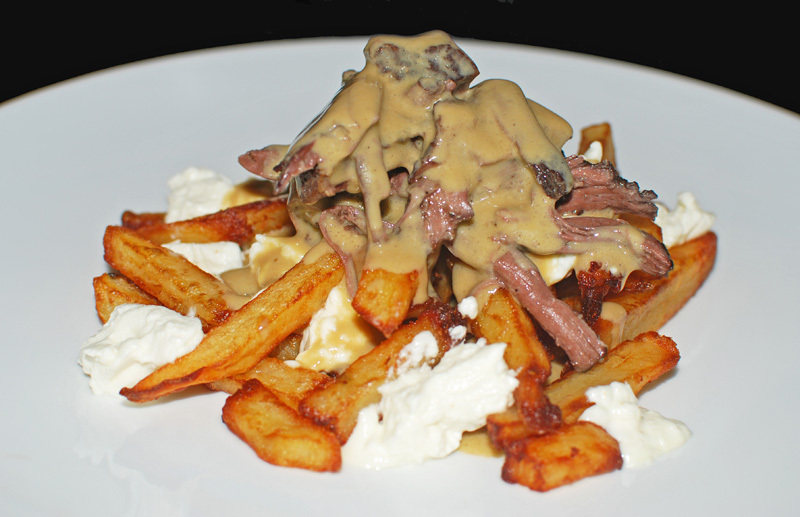 So block your whole weekend and make your own Vladimir Poutine from scratch! 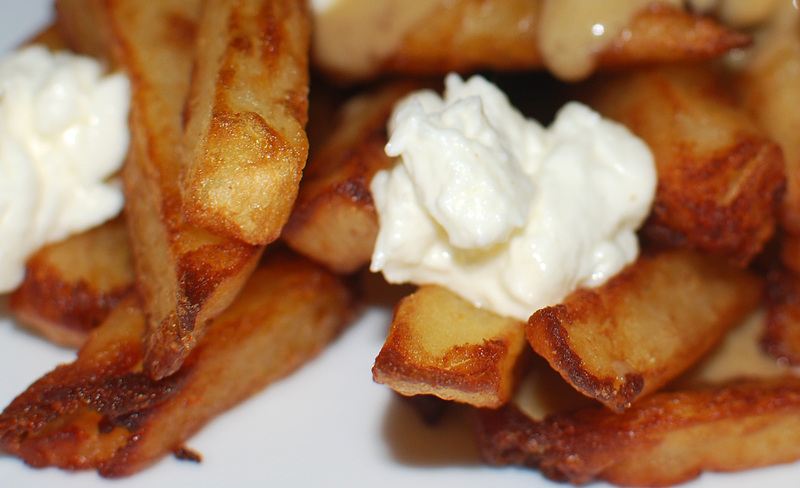 The French fries recipe is adapted from Heston Blumenthal’s In Search of Perfection. These are guaranteed to be the best fries you’ve ever eaten. To make the cheese curds, I used the beginning of the cheddar recipe from Ricki Carroll’s Home Cheese Making. The resulting curds are tasty without being acidic and do make squeaky noises, though maybe not enough to my taste. I purchase my bear meat from Czimer’s Game & Seafood. Since this is farmed meat, it doesn’t really need to be marinated. If you happen to have killed your own bear, marinate it in red wine overnight first (and send me a couple pieces of that bear!). The ribs are an excellent choice for braising. The braise also provides the perfect basis for an all-natural gravy: all we have to do is reduce the cooking liquid and thicken it with a liaison of egg yolk and heavy cream. Note: the cheese curds in this image are NOT the ones in the final recipe. See below for the good ones! In a pot, sauté the onion, carrot, celery and garlic in olive oil until golden brown, then reserve. Season the bear with salt and pepper, and sauté in the same pot until brown on all sides. Add the red wine, and simmer for a couple minutes. Return the vegetables to the pot, add the thyme, cloves and juniper berries, and stir well. Add the pork stock and enough water to cover. Bring to a simmer, cover with a lid, and cook in 180 F oven for about 4 hours, until very tender. Let cool for 30 minutes. Take the meat out of the cooking liquid. Pass the liquid through a chinois and reserve. Discard the bones and any excess fat. Shred the meat into finger-sized pieces, transfer to a plastic container, top with cooking liquid and reserve. In a saucepan, sauté the mushrooms in olive oil until soft. Add the bear cooking liquid, bring to a boil, and reduce to 1/4. Ah, the perfect squeaky cheese curds! Heat the milk to 86 F, then stir in the starter. Cover and keep at 86 F for 45 minutes. Add the diluted rennet and mix for 1 minute. Let rest for another 45 minutes. 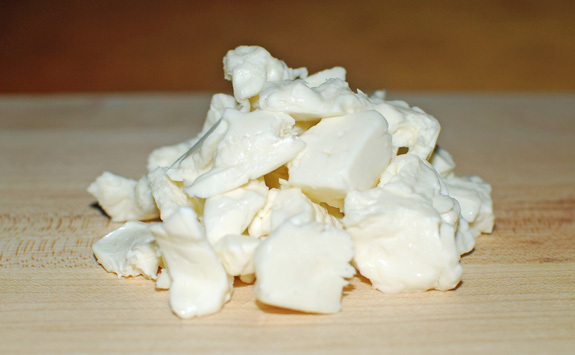 Cut the curds in 1/2″ cubes and let set for 15 minutes. Slowly heat to 100 F and keep at 100 F for 1 hour, stirring gently every 10 minutes. Let rest for 30 minutes. Pour the curds into a sieve and let drain for 5 minutes, shaking occasionally. Do not drain for too long, or the curds will mat. Mix in the salt, then keep at 100 F for 1 hour, stirring every 10 minutes to prevent matting. Drain again and reserve. Fill a pot large enough to contain the potatoes with water mixed with 1% salt, and bring to a boil. Cut the potatoes into 1/2″ thick fries. Add to the pot, return to a simmer, and cook over medium heat until the potatoes are just starting to break when you pick them out (you should start watching for this after about 15 minutes of simmering). Using a skimmer, transfer the fries to a cooling rack, let cool, then refrigerate until cold. Fill a deep-fryer with the canola oil, and bring to 250 F. Proceeding in batches if necessary, deep-fry the fries until they look dry and slightly colored. Don’t overfill; the potatoes tend to release a lot of water, which increases the liquid-level in the fryer. Transfer to a cooling rack and discard (or eat) the small broken potato pieces — there will be some, unavoidably. Let cool, then refrigerate until cold. Note: the cheese curds in this image are NOT the ones in the final recipe. See above for the good ones! Reheat the braised bear meat in the cooking liquid very gently. Pour the bear sauce into a saucepan. Mix the heavy cream and egg yolk, then stir into the sauce. Over low heat, stir constantly, until it coats the back of a spoon. This gravy must never boil. Bring the deep-fryer to 375 F, then deep-fry the fries again until golden brown. Transfer to a bowl lines with paper towels. Pile some fries at the center of each plate, top with cheese curds and bear meat, and cover with sauce. Chicken tabaka is a Georgian dish prepared in a special pan with a lid, called the tapaka. 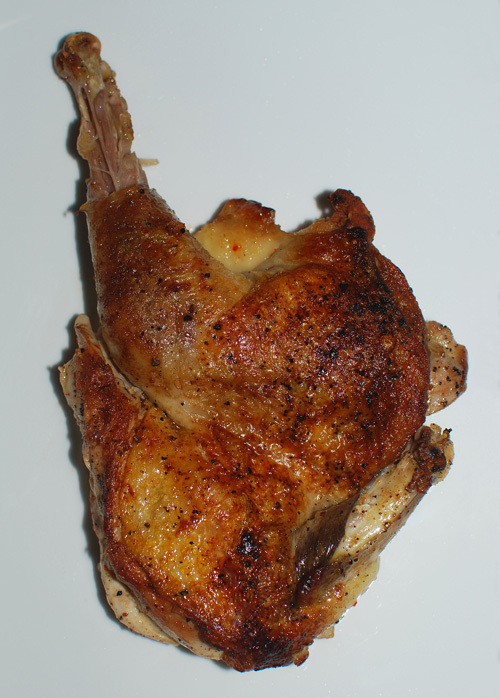 A small bird (usually a poussin) is flattened and fried whole until brown and crispy on all sides. You can get some very good pictures of the process here (the site is in Russian, but Google Translate does a decent job). The carcass is sometimes flattened with a meat pounder; it’s not rare in restaurants to hear loud banging noises coming from the kitchen just after you order your tabaka! My main problem with the original recipe is that you end up with too little meat and too many bones. I like replacing the poussin with a fleshier bird, like a guinea hen, and splitting it in half to serve two people. I get rid of the carcass and some of the wing joints, and keep only the bones that most people enjoy gnawing on. This also allows me to expose most of the skin to the frying pan. The rest of my preparation focuses on optimizing two qualities of a good chicken: tender meat and crispy skin. To that effect, I brine the meat as with the Guinea Hen Satsivi, then fry it in a hot pan skin side down, before finishing it in a very hot oven without flipping it. This dish is meant to be complemented with sauce or vegetables, which is why the recipe lists so few ingredients. Try it with tkemali or with a red pepper purée. Cut off the last 2 wing joints of the chicken and reserve for stock. Separate the meat from the carcass in two halves, starting from the breastbone. Each half should now consist of a boneless breast and bone-in wing joint and leg, skin-on and in one piece. Reserve the carcass for stock, as well. Place the chicken halves in a pot, cover with a brine made of cold water blended with 7% salt, and refrigerate for 6 hours. Discard the brine and soak the chicken in fresh cold water for 1 hour, changing the water every 15 minutes. Pat the meat dry with paper towels, and sprinkle with piment d’espelette on all sides. Melt the clarified butter in a hot pan, add the meat skin side down, and sauté over high heat until brown. Transfer to a 500 F oven for about 15 minutes without flipping. Remove from the pan, let rest for a couple minutes, and serve. This dish is inspired by a recipe called “Veal Escalops Dubrovnik Style” that I found in All Along the Danube, by Marina Polvay — someone who has managed to both present a food show called Cooking with Elegance and pen The Dracula Cookbook. Her veal recipe distinguishes itself by an unusual technique: after preparing a sort of mushroom risotto, Polvay purées it in a blender, mixes it with whipped cream and pipes it on top of veal cutlets. But even more interesting is the fact that nowhere else, in Croatian cookbooks or on the Internet, have I found any trace of this Veal Dubrovnik. Marina, if you ever read these lines, please enlighten us! Anyway, this gave me an idea. Everybody knows about veal Milanese, Genoa cake, Wiener schnitzel, or paella Valenciana in Western Europe. The U.S. boast the Philly cheese steak sandwich, New York cheesecake, Chicago pizza, and Boston cream pie. What does Eastern Europe have? Chicken Kiev, a greasy mess that isn’t really from Kiev, or even Ukraine for that matter. Hortobagy pancakes, a delicious dish that is unfortunately almost unheard of outside of Hungary. Some preparations of “Prague this” and “Moscow that” that have never really made a name for themselves. This is unfair, but you and I, my dear readers, can change this! Let’s spread the word that there’s a new dish from the Adriatic. 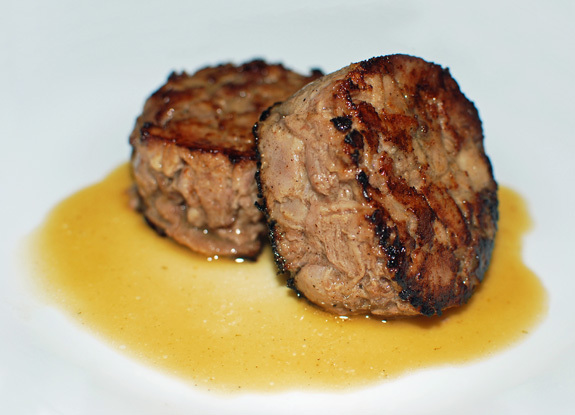 Post adapted versions of the Veal Dubrovnik on recipe web sites. 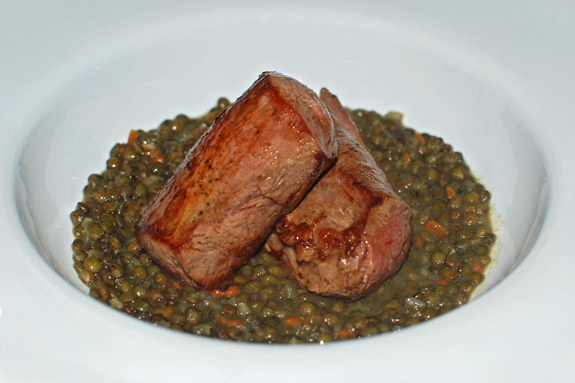 Whenever you eat in a Croatian restaurant, tell the owners you would like to see Veal Dubrovnik on the menu. Inform the Croatian National Tourist Board that their overview of local gastronomy is incomplete without a mention of Veal Dubrovnik! 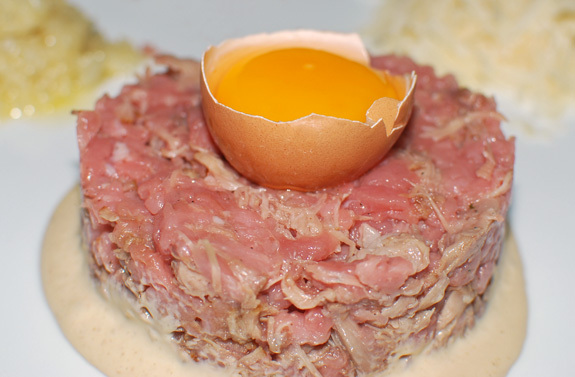 My rendition of Veal Dubrovnik is a kind of elaborate tartare. It is best enjoyed with toasted bread or French fries. The osso bucco and the risotto cream can be prepared a day in advance. Have bottles of Worcestershire sauce, Tabasco sauce, olive oil and balsamic vinegar on hand to let your guests finish the tartare to their liking. Season the shanks with salt and pepper, and sauté with olive oil in a pot over high heat until brown on both sides. Reserve. In the same pot, sauté the celery, carrot, onion and garlic with a bit more olive oil until soft. Add the thyme, clove and white wine, and cook until reduced by half. Add the veal stock and enough water to cover the meat and vegetables and bring to a boil, then cover with a lid and cook in a 200 F oven for about 3 hours, until the meat is very tender. Let cool for 30 minutes. Take the shanks out of the cooking liquid. Remove the bones, reserve the meat and bone marrow in a plastic container, cover with cooking liquid and refrigerate. Pass the remaining cooking liquid through a chinois and reserve. Reheat the osso bucco liquid and reserve. Heat 1/3 of the olive oil in a saucepan over medium heat, add the rice and stir for 1 minute. Add 1/3 of the osso bucco liquid with the dried porcini, thyme, pepper and salt, and cook over medium heat until the liquid is fully absorbed, stirring constantly. Add another 1/3 of the liquid and simmer over low heat until fully absorbed, still stirring regularly. Remove from heat, cover with a lid and let rest for 10 minutes. Transfer the risotto to a blender, add the heavy cream, the rest of the olive oil and the remaining osso bucco liquid, and process until smooth. Pass through a chinois, transfer to a plastic container and refrigerate. Place the veal tenderloin in the freezer for about 30 minutes. In a saucepan over medium heat, sauté the onions with half of the butter, season with salt and cook until golden brown but still slightly crunchy. Reserve. In another saucepan over medium heat, sauté the mushrooms in the rest of the butter, season with salt and pepper, and cook until the rendered liquid is fully reduced. Reserve. Finely grate the parmesan and reserve. Chop the veal tenderloin into a fine brunoise and transfer to a bowl. Shred the osso bucco meat and marrow between your fingers and add into the bowl with 1 tbsp of osso bucco liquid, and mix well. 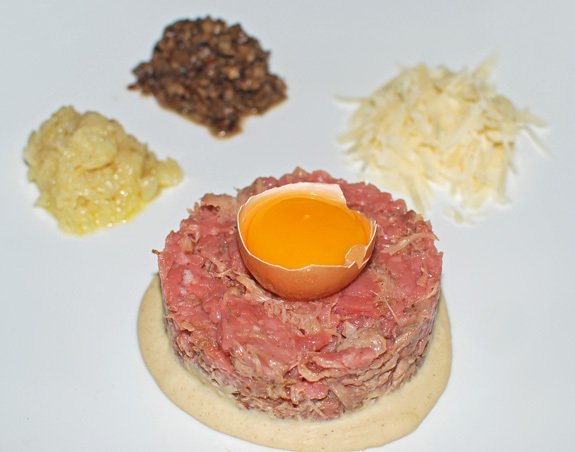 Arrange the plates as pictured, with the tartare on a bed of risotto cream, topped with an egg yolk and surrounded with the garnishes. The dish should be cool but not too cold. Wild boar is eaten all across Eastern Europe, from eastern Germany to Russia. It is a common charge in heraldry, displayed on the coat of arms of Ebersbach in Saxony. Boar hunting was also one of Brezhnev’s favorite pastimes. Filet mignon, the tenderloin, is one of the only cuts of wild boar that is best enjoyed rare or medium rare, a welcome change from the usual boar stews and sausages. Although generally cultivated somewhere else, lentils are widely consumed in Eastern Europe, particularly in soups like this one. The lentils here don’t quite form a soup, but they should be liquid enough to be used as a sauce for the meat. To make the smoked pork stock I am using below, you can either buy smoked ham hocks, or save the bones from smoked pork ribs. Reduce the smoked pork stock by 1/3 and reserve. Put the lentils in a large saucepan, add just enough water to cover them, and bring to a boil. Remove from the heat immediately, drain in a sieve and rinse under cold water. Return to the saucepan and add the reduced pork stock, carrot, celery, celery root, onion, thyme leaves, salt and pepper. Bring to a boil, then simmer on minimum heat for about 1 1/2 hours, until the lentils are very tender. If all the liquid is absorbed, add a bit of water. Cut each tenderloin into 3 pieces, and season with salt and pepper. Sauté in a hot pan with olive oil until brown on all sides, then add the whisky. Remove the pan from the heat and let rest for about 5 minutes, turning the meat once. If you like your meat cooked more, finish in a 350 F oven to reach the desired doneness. 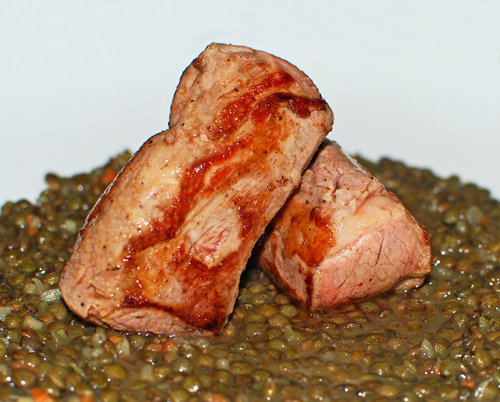 Serve on a bed of smoked lentils. 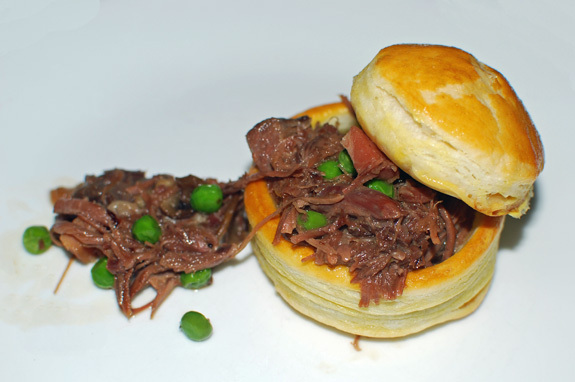 Here is another recipe I adapted from the Derrydale Game Cookbook. The original had you keep the whole bird on the bone, which must have been pretty hard to cut and eat once it was wrapped in forcemeat and ham! My pheasant is completely boned before being rolled, and the legs and wings, which are too tough to be enjoyable, are used for stock. I also made several other small tweaks throughout the recipe. According to the Greek historian Aeschylus, common pheasant originated along the banks of the Rioni River in Georgia. Hence its scientific name, Phasianus colchicus, as Colchis designated a region of Western Georgia in ancient geography. I encourage you to use real wild pheasant, whether you hunt it or buy it. You’ll have to watch out for buckshot, but it’s worth it for the taste. Serve the dish with a mix of mushrooms, also wild if possible. Cut the wings and drumsticks from the pheasant carcasses, and reserve for stock. Position each pheasant on its breast, and starting from the middle, separate the meat from the carcass. Once you’re done, you should have the breast and thighs still attached together. Bone the thighs and remove the skin. At this point, the meat is likely to break into 2 or 3 pieces (the skin was largely responsible for holding it together), but this is fine. Reserve the carcass and bones for stock. 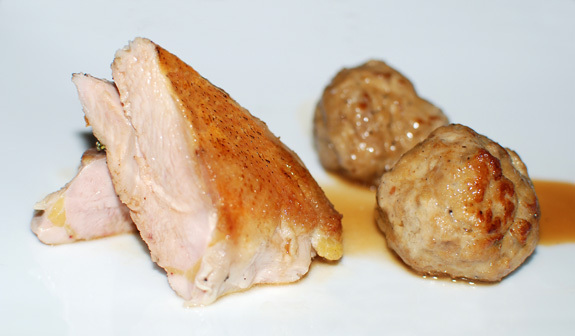 Process the additional poultry meat, skin, and livers through a meat grinder using the small die. On a sheet of plastic wrap, arrange 3 or 4 slices of prosciutto so that they form a rectangle slightly larger than each boned pheasant. 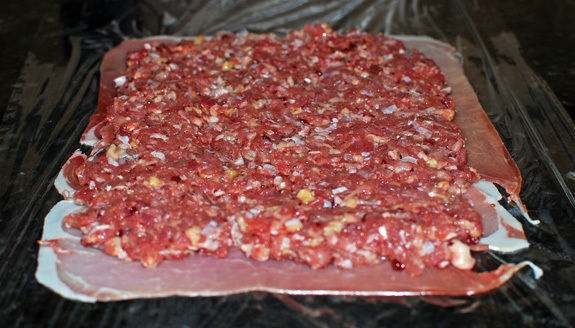 Cover with half of the ground meat, leaving a border clear around the edges. Do not season with salt as the prosciutto is already salty. 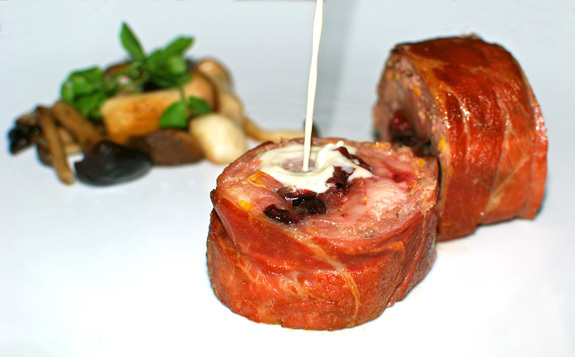 Arrange a boned pheasant on top, so that it more or less covers all of the ground meat. Season with salt and pepper, and sprinkle with half of the dried cranberries. Starting from the edge near you, wrap the meat into the prosciutto to form a log. Tightly wrap the log into 2 layers of plastic film. Repeat with the other pheasant. Refrigerate for at least 6 hours. Sauté the onion and garlic with the butter in a pan over medium heat. Season with salt and pepper, and cook until soft. Add the white wine and reduce almost completely, then add the stock and reduce to 1/4. Add cream, simmer for 5 minutes, and let rest for 15 minutes. Process in a blender until smooth, then pass through a chinois and reserve. Remove the pheasant logs from the plastic film, and tie with butcher’s twine to further secure shape. Sauté with olive oil in a hot pan until brown on all sides. Add 1/2 cup water and transfer to a 200 F oven. Cook for 1 1/2 hours, turning the meat when halfway done. Cut off the twine and slice eat wrap into 4 pieces. The thigh meat will still look pink, which is fine, whereas the breast part will be much whiter. Reheat the smitane sauce in a small saucepan and pour over the meat. Serve immediately. Like many parts of the animal not normally used in modern Western restaurants, lamb tongues are common in the Caucasus. You can find boiled tongues on the menu at Apsheron in Sheepshead Bay. This small and somewhat scarce meat cut owes its relative popularity to its pronounced lamb flavor and its unique texture that melts in your mouth. Nevertheless, it still suffers from a serious appearance problem: most people are not inclined to put into their mouth a tongue that does not belong to, say, their significant other. This is where this recipe saves the day. Braising the tongues preserves their texture and flavor, but shredding them and reshaping them into a log makes diners forget what part they’re eating. In order to bind the reshaped meat, I use transglutaminase, a “meat glue” that can be purchased here (it’s usually sold in large bags, but all you’ll ever need is a few tablespoons). However, you should be able to obtain a similar result with a beaten egg. Blanch the lamb tongues in salted boiling water for 5 minutes, drain and reserve. In a pot, sauté the fennel, carrots and zucchini in olive oil over medium heat until golden brown. Add the pepper, thyme, rosemary, cloves and white wine, and cook until reduced by half. Add the lamb tongues and enough lamb stock to cover them, then bring to a simmer over high heat. Transfer the pot to a 200 F oven, and cook for about 3 hours, until the tongues are very tender. Let cool for 30 minutes. Take the tongues out of the pot and reserve. Strain the cooking liquid, transfer to a saucepan and reduce over high heat to about 3/4 cup, so that it coats the back of a spoon. Whisk in the butter and let cool. Peel the lamb tongues and shred them between your fingers into a bowl. Mix in the transglutaminase, then 2/3 of the reduced liquid. Transfer to a sheet of plastic wrap and roll tightly into a log, about 6″ long. Refrigerate for at least 6 hours. Reserve the rest of the liquid to use as sauce. 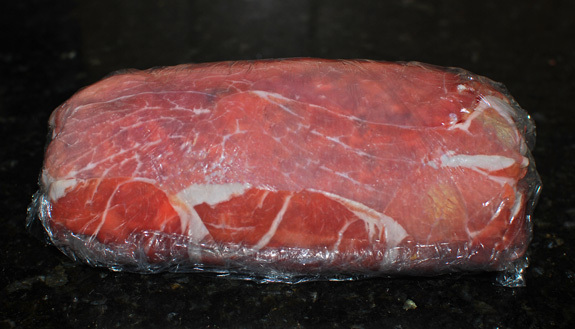 Remove the lamb log from the plastic wrap, and cut into 4 slices. Sprinkle both sides of each slice with Wondra flour, then sauté with olive oil in a hot pan until brown on both sides. Finish in a 350 F oven for about 5 minutes. Serve 2 slices on each plate, with a bit of reheated sauce on top. Up until the first world war, Hungary and Bohemia boasted several great estates for partridge shooting. Thousand of gray partridges were then exported to North America, making them one of the principal game birds here to this day. Although the only American partridges you will find in stores are farmed, a curious loophole allows the sale of real Scottish game birds in the US. I get mine from D’Artagnan. This dish is inspired by several recipes from The Derrydale Game Cookbook, a hunting classic published in the 1930’s that teaches you to cook anything from squirrel to black bear, with a surprising number of Eastern-Europe-inflected entries. The gamy flavor of partridge pairs wonderfully with the sweetness of Tokaji, a Hungarian dessert wine that counts among my favorites. The proportions yield more dumplings than you will need; use the leftovers in a winter soup. Place the brioche on a sheet tray, and dry in 300 F oven for 20 minutes, flipping the slices after 10 minutes. Let cool for a few minutes. Transfer to a blender, and process until all the chunks are gone. Place the eggs, egg yolk, butter, partridge meat and liver into a blender (or food processor), and process until smooth. Season with salt and pepper, add the garam masala, porcini powder and breadcrumbs, and mix well. To adjust the seasoning, cook a small bit of the preparation in a pan and taste it. Cover and refrigerate for 30 minutes. In a pot, bring the stock to a boil. Shape 14 round dumplings out of the partridge mixture, and cook in the boiling stock for about 6 minutes, a few dumplings at a time. Reserve. Keep the stock for the Tokaji sauce. Before serving, sauté the dumplings in a hot pan with olive oil, until golden-brown on all sides. Season the breasts with salt and pepper on both sides, then sprinkle with thyme. Place in a sous-vide pouch with the butter, and cook in a 136 F water bath for 1 hour. Before serving, sauté the breasts skin side down in a hot pan with the butter from the sous-vide pouch. In a saucepan over high heat, reduce the stock to about 1/4. Add the Tokaji wine, and reduce until the sauce coats the back of a spoon. Whisk in the butter before serving. As I reported in a previous post, I went deer hunting earlier this month. While somebody who actually knows what he’s doing was driving the hunt, I was hiding in tree stands or blinds like this one, observing my little patch of forest. Believe me, after 4 hours spent sitting in a tent without moving, in the Catskills Mountains in winter, no matter how well dressed you are, you get pretty cold! My toes were in a state comparable to what I felt last year when I went swimming in Brighton Beach in mid-December. I decided to take my revenge by ordering a rack of venison, which I prepared with a cider sauce and paired with some pan-seared foie gras and blood sausage on a potato pancake. I often make my own blood sausage, but this one I found at a Christmas Bazaar organized by the New York Estonian House. If you want to learn more about blood-sausage making, check out this article from the New York times, or try the class at the Estonian House in early December next year. In a saucepan over medium heat, sauté the shallots and garlic with olive oil until soft. Add the pancetta and the mushrooms, and cook until the mushrooms are soft. Add the thyme and stock, and reduce to about 1/4. Add the hard cider, and reduce until the sauce coats the back of a spoon. Stir in the butter just before serving. Season the rack with salt and pepper on all sides. Sauté with canola oil in a very hot pan until brown on all sides. Transfer to an oven-proof dish, sprinkle with thyme, and cook in a 300 F oven to the desired doneness. Count about 35 minutes for rare. Let rest in a warm place for 5-10 minutes. Cut the racks into 8 separate chops, and serve with the sauce.